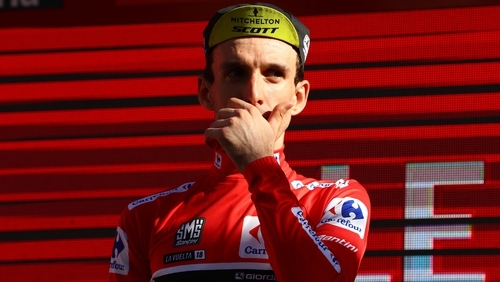 Simon Yates has one more mountain stage to pass in his bid for La Vuelta victory after stretching his lead by more than a minute with a superb ride on stage 19 to Andorra. The English rider finished second to Frenchman Thibaut Pinot atop the Coll de la Rabassa, but successfully distanced his main rival Alejandro Valverde by over a minute to increase his advantage before Saturday's decisive stage 20 to a summit finish on the Coll de la Gallina in Santuario de Canolich. The provisional general classification showed Yates with a lead of one minute 38 seconds over Movistar's Valverde, with LottoNL-Jumbo's Steven Kruijswijk third a further 20 seconds back. Yates, 26, is seeking his first Grand Tour victory and what would be a fifth consecutive Grand Tour win for a British rider. Ireland's Nicolas Roche is 44th on the general classification for BMC Racing. He crossed the finish line in 68th today. It was a second stage win for Groupama-FDJ's Pinot following his success on stage 15, but all eyes were on the fight between Yates and Valverde. Yates was happy to let Pinot take stage honours, knowing he has put himself in the box seat to effectively secure victory on Saturday before Sunday's processional stage into Madrid.